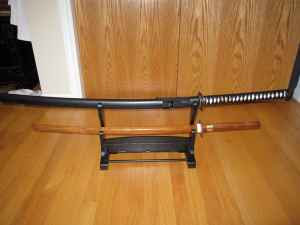 I saw your ad on Craig's List for the sword/katana rack http://vancouver.en.craigslist.ca/fuo/1086874632.html . You made the mistake of putting up a photo of it with your katana on it. You may as well just put up a sign saying "Come take my sword/katana stand because my katana is of such low quality that I can't defend it". If I were to show up with my katana (or even just my tachi!) I could cut your katana into a million pieces. But that may be because I have an 8th level black belt in Shoa Lynn. If you need to hire my security services just let me know. "I saw your ad on Craig's List for the sword/katana rack http://vancouver.en.craigslist.ca/fuo/1086874632.html . You made the mistake of putting up a photo of it with your katana on it. You may as well just put up a sign saying "Come take my sword/katana stand because my katana is of such low quality that I can't defend it". If I were to show up with my katana (or even just my tachi!) I could cut your katana into a million pieces. But that may be because I have an 8th level black belt in Shoa Lynn. If you need to hire my security services just let me know."